A signed, limited edition digital print (100 in total) taken from an original artwork in pastel. 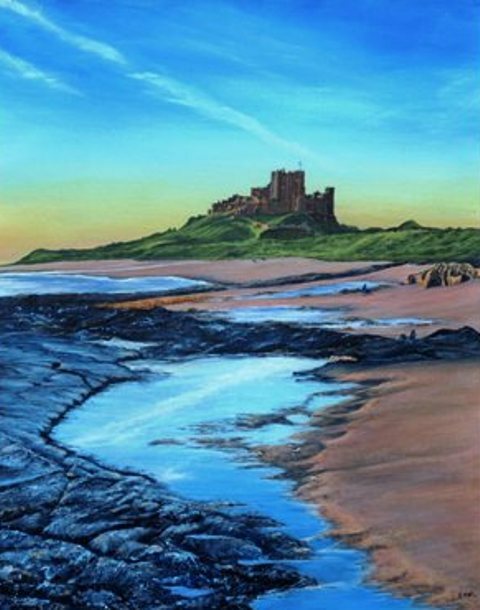 Showing the beautiful Bamburgh Castle in Northumberland, as the sun rises over the sea, lighting up the castle, beach and waves as they gently lap onto the golden sands of this beautiful, award winning beach. Children sit on the rocks, watching the day begin and dog walkers stroll happily with their pets, enjoying their peaceful surroundings. Complete with a Certificate of Authentication on the reverse.